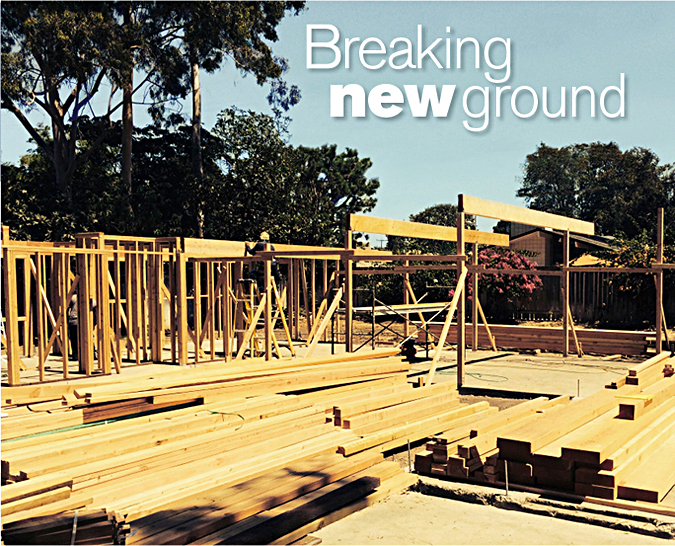 The Bryan Ross-Kelly Laule Eichler rebuild in Orange during framing. 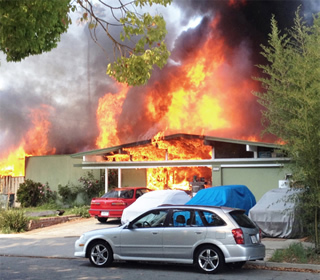 Carol Heidenreich's San Jose Eichler engulfed by flames. There was never any doubt in Carol Heidenreich's mind what she would build after a fire last April destroyed her San Jose Eichler home. "We plan to replace it exactly as it was, with the Philippine mahogany," she said six weeks after the fire, which also destroyed a neighbor's home and severely damaged a third. But can you replace a mid-20th century Eichler exactly as it was in the early 21st century, given major changes in seismic and other building codes, energy regulations, and in how people want to live? And would you want to? Based on recent conversations with homeowners, architects, and builders who have tried to recreate lost Eichlers, the answer to the first question seems to be "yes." The answer to the second is "it depends." For someone like Heidenreich, who really loved her home, of course she would replace it, simply out of fondness. For Kelly Laule, a real estate broker with Eichler SoCal in Orange County with a deep appreciation of the historic value of Eichlers, and for home designer, remodeler, and house-flipper Bryan Ross of Bryan Ross Designs, the decision to replace a burned Eichler in Orange with one that has been rebuilt and upgraded was all about preserving the character of the surrounding Eichler neighborhood. It was also about producing a home that would find favor on the market. For the clients of architect John Klopf of Klopf Architecture, the decision to replace a burned Eichler in the San Mateo Highlands, not with a reproduction Eichler but with a larger home rooted in the mid-century aesthetic, was about building something in character with the neighborhood while providing more living space. In every case, those concerned say, the challenges have been great—but, to this point, seem worth it. At this writing, all the projects were in various stages of progress. To all those who say it's not possible to build a glass-walled, open home in today's regulatory climate, Henry Calvert of Calvert Ventures, the San Mateo-based general contractor working with Klopf, replies, "You still can, absolutely." "There are new codes every year," says Calvert, who has been remodeling and repairing Eichlers and building new homes for more than two decades, and who lives in an Eichler in the neighborhood. "I think this home will be a good example of proving them wrong," he adds of the Highlands rebuild. "There are always ways to engineer your way around your design ideas." "It's been a very, very, very challenging project," Ross says of the 1960 Eichler he's recreating in the Fairhaven tract in Orange. "These [original Eichler] houses don't come even close to current standards. I'm making it look exactly the same, yet it will perform like a 2014 property."